Americans use 80 to 100 gallons of water per day1 and whether for drinking, washing, or cooking, the household tap is the common source. For many, not much thought is given to the clean water coming out of those taps or what happens after it leaves. However, those of us in the business understand and appreciate the engineering of clean water. Water treatment is of keen interest, both professionally and personally. Water treatment, primarily for smell and taste, dates back as far as 4000BC2. Traditional boiling, filtering, or fermenting could improve water quality, but not all pathogens were removed. Chlorine compounds were first used as a disinfectant in the early 1800’s as chlorine effectively kills bacteria, viruses, and many single celled organisms3. Due to its effectiveness in treating pathogens, chlorine was first added to treat drinking water in Jersey City, New Jersey in 19084. It is currently employed, in one shape or form, by over 98 percent5 of the 53,000 community water systems6 in the U.S. While commonly used, the application of chlorine in water treatment does not come without drawbacks. Regulations are in place for acceptable levels not only of chlorine in water7; but for other contaminates such as trihalomethanes and haloacetic acids, carcinogenic by-products of the chlorine disinfection process8. Rigorous metering and monitoring of chlorine is required, regardless of its form: chlorine gas or liquid, chlorine dioxide, hypochlorites or chloramines. Additionally, all the reasons chlorine is used in water treatment are the same reasons that chlorine, when mishandled, is a very dangerous substance. The OSHA personal exposure limit (PEL) is 1 ppm9 and the CDC Immediately Dangerous to Life or Health (IDLH) level is 10ppm10. Clearly, special precautions need to be taken for the safe delivery, storage, and handling of chlorine. ProMation Engineering was approached in 2011 by a client requiring electric actuators and site specific engineering solutions for a water treatment retrofit project. The system was being upgraded and existing actuators controlling the chlorine injection system were to be replaced. Many chlorine treatment facilities in utilize large-scale chlorine storage vessels requiring only few control valves. This facility is an older water treatment plant that did not have rail access nor are they able to have a semi-tanker supply the chlorine in bulk. Several one ton canisters were therefore used to supply the chlorine for injection. But because of the frequency of canister changes and the inherent safety hazards due to leaks, safety was to be a paramount concern during the design phase of the project. The system consisted of 20 chlorine gas containers feeding 20 chlorine lines. Electric actuators fitted with local control capability operated one inch ball valves on each of the 20 lines. The lines fed a manifold, which in turn fed the chlorine injectors as the water entered the settling tanks. The local control stations allowed individual control of each valve/canister to isolate them when replacing empty canisters as well as to determine valve position at a glance. The existing electric actuators showed signs of being affected by the chlorine gas after only a few months in service. Further, one unit was known to have failed to close when commanded and failed to accurately indicate its position. Obviously, the client was concerned and decided all the actuators needed replaced during the upgrade. The customer sent site plans and specifications to ProMation. 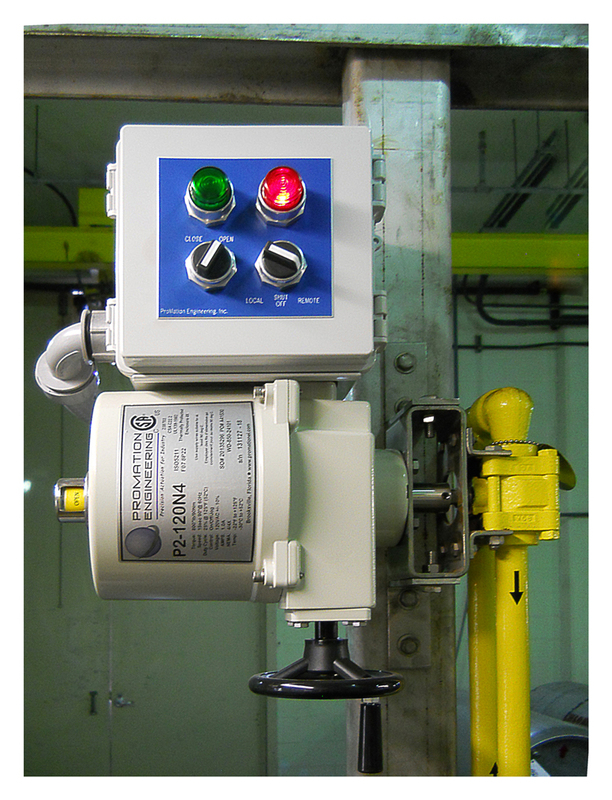 ProMation provided a proposal for actuators and custom local control stations. After review, the client requested a prototype of the design be tested on site for 16 months. The initial test unit was installed in late 2011. The units met and exceeded the customer’s expectations. The client contacted ProMation Engineering in 2013 to proceed with changing out the remaining actuators. Before moving forward with the complete installation, the client requested modifications to the local control stations to improve safety. ProMation’s mechanical and electrical engineers worked with the consulting engineers to understand the application and suggest solutions that not only fit the needs, but also budget. In order to change a canister, the first step is to take the actuator offline for local operation to shut the valve. In consultation with the engineering firm, ProMation customized the signal from the actuator to notify process control that the valve and canister were offline. Emergency shut off buttons were also added at each local control station. ProMation, again with the agreement of the consulting engineers, wired the local control station so that the local emergency shut off would operate the actuator to close the valve and notify process control that the emergency switch was activated. ProMation further tailored the local control stations so that a general emergency signal from process control would override any local control to close the valves. Lastly, the customer desired push-to-test indicators so that the operator could confirm the valve is in the indicated position and that the indicator was functioning properly. The initial design also called for hazardous location enclosures for combustible gases. While sometimes needed in below grade facilities in wastewater treatment, Class 1 Division 1 enclosures were not necessarily needed in this case. ProMation mechanical and materials engineers noted chlorine itself is not explosive; but deadly11. It is chlorine’s violent reactivity with other materials that can cause explosions12. Therefore, the key factor was the reactivity and not combustible gases and associated control of the chlorine during processing. Specifying NEMA 4X enclosures met the environmental requirements and allowed the project to stay within budget. ProMation worked with the consulting engineers over the course of 3 months and five generations of designs. The final design combined ease of use, process control and safe handling while staying within budget. The final design package consisted of 20 P2-120N4 (NEMA/4X enclosure, 800 in lb of torque) On/Off quarter turn electric actuators fitted with custom Local Control Stations. The P2 series was chosen because manual operation with a handwheel was required. The custom designed Local Control Stations used not only the additional safety electronics, but NEMA 4X fiberglass enclosures with upgraded seals and conformally coated printed circuit boards to prevent corrosion as well as oversized switches and knobs for ease of operation. ProMation now recommends these enclosures for other customers with similar projects involving chlorine injection system support. Installation of the new actuators and local control stations were hot swapped over the course of 10 days. During installation it was found that one of the actuators/local control stations could not be installed because of an existing pipe. The unit was returned to ProMation and the local control station was re-fitted on the opposite side of the actuator to accommodate the available space. A ProMation field engineer was on site to oversee a portion of the commissioning and received glowing reports of the units which perform as advertised. Commissioning occurred in early 2014 in the system has been in place working flawlessly ever since. 4 CDC. A Century of U.S. Water Chlorination and Treatment: One of the Ten Greatest Public Health Achievements of the 20th Century. Morb Mortal Wkly Rep. 1999;48(29):621-9. 7 Basic Information about Disinfectants in Drinking Water: Chloramine, Chlorine and Chlorine Dioxide, EPA, http://water.epa.gov/drink/contaminants/basicinformation/disinfectants.cfm#What are EPA's drinking water regulations for disinfectants? 8 Basic Information about Disinfection Byproducts in Drinking Water: Total Trihalomethanes, Haloacetic Acids, Bromate, and Chlorite, EPA, http://water.epa.gov/drink/contaminants/basicinformation/disinfectionbyproducts.cfm#What disinfection byproducts does EPA regulate, how are they formed, and what are their health effects in drinking water at levels above the maximum contaminant level?